The Codex Committee on Contaminants in Food (CCCF) provides a global forum for governments to harmonize regulatory management measures, based on common science, risk assessment and best practices. At the recent 12th meeting of the Committee, good progress was made in some areas, although a key observation when discussing the setting of Maximum Levels for contaminants was an increasing pattern of country delegations fixed on their national legislation and unwilling to find a harmonized compromise. Common harmonized regulatory Maximum Levels for contaminants can help facilitate international trade. Maximum Levels for contaminants in food are necessary where risk assessments determine that exposure to a given contaminant should be reduced, and where setting a threshold is an appropriate way to help manage the risk. Moreover, common harmonized regulatory Maximum Levels for contaminants can help facilitate international trade. Setting simple, common regulatory standards helps make it easier for global compliance, for ingredient sourcing, for local education on why the regulated levels are needed, and for producing-countries to more consistently manage contaminants in raw ingredients. Common standards are more effective at reducing global dietary exposure, benefiting consumers in all regions. So why stick with national legislation in cases such as aflatoxins in ready-to-eat peanuts, where global assessments show potential for a reasonably achievable, health-protective harmonized approach? Aflatoxins in ready-to-eat peanuts is a clear example where a common global standard would have significant, realistic benefits globally for producing countries and peanut supply. Countries already operate a range of Maximum Levels, although several delegations were unable or unwilling to find compromise, despite the JECFA risk assessment (the Joint WHO/FAO Expert Committee on Food Additives provides the global risk assessment to help the Committee take harmonized, science-based risk management decisions), and despite real achievability challenges at the stricter levels. A common global standard, based on risk and what is globally As Low As Reasonably Achievable (the ALARA principle) means just one standard for producers, just one common specification for all suppliers of the ingredient, making education easier, sourcing easier, as well as time and cost efficiencies. If producing regions, particularly developing countries, have a single standard it will help their education on practices and health context, whether for export or for local consumption. A common practice in producing countries is selecting different grades of ingredients to meet standards for different countries solely as a compliance requirement, rather than part of a health-aware, best-practice production culture. For the success of the Committee’s work, delegations need to be more prepared to compromise for realistic benefit to global public health, to enable international trade, helping producers, farmers, developing countries, the manufacturing industry, and helping consumers by focusing on health risk and achievability. Reducing food production costs and food waste are important issues negatively impacted by multiple standards. This is a concern where countries are not flexible to update overly strict national regulations, despite new global data and global risk assessment that indicates no tangible health concern. Why waste food unnecessarily? It makes sense for Codex to harmonize levels leveraging global data. For cadmium in chocolate products and cocoa, this is another example where Codex has gathered global data giving a basis for some countries to review existing regulations, to work towards reasonably achievable global standards. The JECFA risk assessment concluded that dietary exposure in these products is low and setting maximum levels is not necessary. Foods contributing more significant amounts of cadmium to the diet already have Maximum Levels set under Codex. Nevertheless, several regions have Maximum Levels in place for cadmium in chocolate products and cocoa. It makes sense for Codex to harmonize levels leveraging global data, to encourage common, science-based standards that are globally reasonably achievable and enable international trade. A key factor for cadmium uptake into crops is the geology in the producing country. Cadmium is naturally present in soils, higher in volcanic soils such as in the Latin America region. New data was gathered by Codex, from the regions and from industry, to help the understanding of presence from different origins and in different product categories, with key learnings for regulators on the presence in cocoa powder vs cocoa butter. This is important information for what is globally reasonably achievable for different categories of product, without unnecessarily compromising regional production and supply. 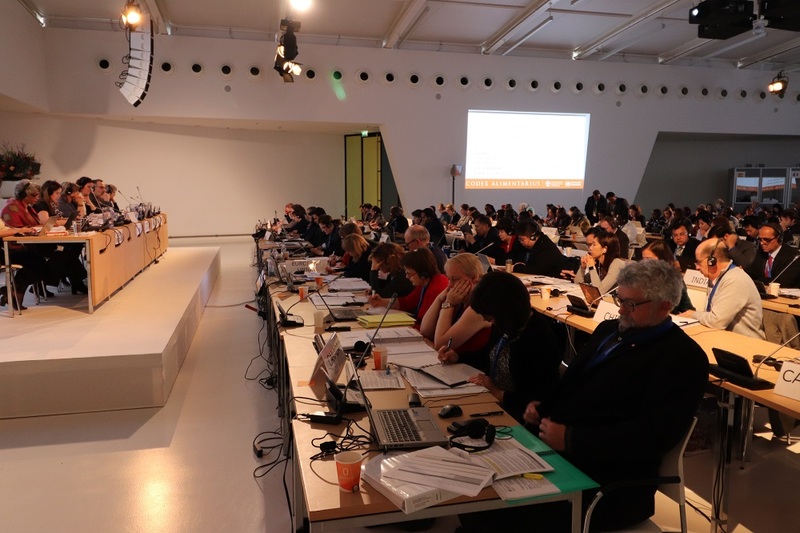 For the 13th CCCF to be held in 2019, I would hope that delegations will be more prepared and authorized to find compromise beyond existing legislation, where global science justifies change and food production would benefit from harmonized global standards.